New to this Olds site, hello to all, Now with Pics! Im new to this Olds site, but have been an Olds guy for many years. Past Oldsmobiles in the stable have been 76 Cutlass supreme, 65 442, 83 Cutlass Supreme w/ t-tops, and the current Olds...1969 Cutlass convert. The hobby has been semi-dormant for me, and I've been bitten by the bug and am now surfing, lurking, and generally excited about operating/improving the car. I was hoping to be able to browse and participate in the classifieds as well..not sure how to get established enough to do that, sorry if its in the FAQ or somewhere and I missed it. Last edited by 69OldZman; May 31st, 2009 at 06:01 PM. Reason: Added reference to pictures. Welcome to the site Charlie, loads of information on here, people are great about answering questions and the mods keep everything friendly, my favorite forum for discussion of my favorite automobile. To control spam all newbies have to post 5 times in order to move to other forums on the site. Tell us about you car and your plans for it, soon you will reach your 5 posts then you can move around. My car is what I'll call 'restified'. Its somewhere between restored and modified. As far as I know, it started its life as a 69 Cutlass, Brown Exterior, Red interior. 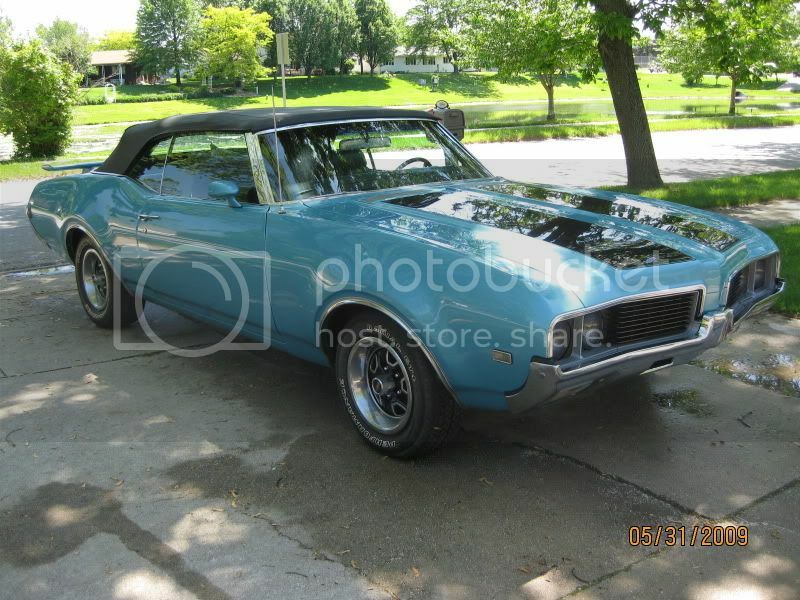 It was purchased by an ex bodyman in Joliet, and now its Teal exterior with black racing stripes on the hood and a 70 442 wing on the deck lid. It has a black interior and top. Things have been smoothed out and holes welded, such that there are no longer any molding/trim spears. (I still have all of it that I may sell/trade later). There are no Oldsmobile logos or Cutlass logos. It has dual modern body color mirrors. Engine is a stock smogger 403 with a not so firm shifting TH400 behind it. I hope to get it running better as is first, then upgrade to early heads to bump compression (one of the mods has some on sale, and I'm looking forward to scoring my 5th post ), and I would like to put a 200-4R behind it to improve driveability. I'll try to take some pics and post perhaps in a few days. Thanks all for listening, I hope there are Northwest Indiana/Chicago area fans here that may be able to network and help find parts etc! There are certainly a few of us from the Chicago area on here. Post some pics when you can. Ok, here's a try at a pic. So you can see it isn't very 'stock' looking. No spears, no Cutlass emblems, newer mirrors, but I like the overall appearance. Its how I found it, and I looked at a lot of junk before I bought it. Clean, original, in this condition would have cost a fortune..so I compromised. That is seriously sweet dude....WOW. Very nice ride. The former owner spent a ton of time filling all the holes from removing the trim and emblems, that's for sure. Looks good that way though. The 442 bumper out back is a nice touch. The mirrors look good also, and he made them fit correctly so they don't sit at an angle from having the wrong pedestal. Thanks Cameo White! The previous owner was a former body shop guy from Joliet. This car was brown with red interior when he bought it. All the holes were welded, and have held up pretty well in the 6+ years I've had it. I hope to have it out more and more this summer. Crown Point has a Thursday night 'classic car' night at the square, so I want to make a few appearances this year. The former owner spent a ton of time filling all the holes from removing the trim and emblems, that's for sure. Insted of trying to find the next to impossible 69 drop top rear quarter chrome. The previous owner gave me many of the 'spears' that were on the car. Can you help me identify the rare/hard to find ones? I would probably be open to selling them, as modification funds are hard to come by nowadays. OMG! She is beautiful!!!! Charlie, do NOT sweat over the way it is... MANY a car nut would give their left nut for that beauty! Many thanks 82! I'm not really sweating her looks, I just know there are many purists out there that might take issue with it. Last edited by citcapp; June 11th, 2009 at 07:02 AM. Shes a beauty for sure man. Nice to meet another Charlie too =) , welcome aboard. They are stored over at my parent's place. Next time I'm over there I'll get them out and take a look. Not sure if its a set, or just a few. I don't have a clue what they are worth either. Very nice looking car, and it looks like you take good care of it. Welcome to CO. And to you too ZipTie, I missed you intro post, sorry. Great looking car Charlie,and welcome aboard!! Anyone with a 69 Olds is a friend of mine....come to think of it ,anyone with ANY Olds is a friend too! Derek.....1969 442 post cpe. That is one AWEsome Olds, dude. The '69 vert is what lit my fire, but all classic Olds are few & far between here in middle-America. I had to "settle" for my '72 S.
My sister in law lives in Ontario, I rarely see classics when I'm there, let alone Oldsmobiles. Have you posted any pics? I hear ya, it wasn't exactly easy to find mine. I looked at a lot of overpriced junk, and got lucky and found this through word of mouth. my name is roy and i live in denton, texas about 30 miles north of dallas and an hour south of the oklahoma boarder. i bought a 67 cutlass supreme convertible about three years ago. the previous owner rebuilt the front end, rebuilt the engine 330. he also put in electronic ignition and replaced the roof and interior. Roy, welcome to CO. Your question may get lost since you tagged it onto someone else's thread. I suggest you cut your post and paste it into a new thread that you start yourself. Many people don't follow a thread after the first few days if they haven't already replied, and then even if they have replied they won't keep following an older thread. A fresh thread introducing yourself the way you did in your post should get some new attention and possibly get some recommendations too. Good luck. Hello All, New the site! new to the site and want to say hello! New to the site. Hello all.